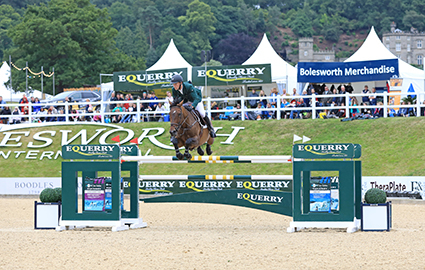 THE teams at Bolesworth International Horse Show and Equerry Horse Feeds are delighted to announce continuing their major title sponsorship agreement for 2019 and 2020. 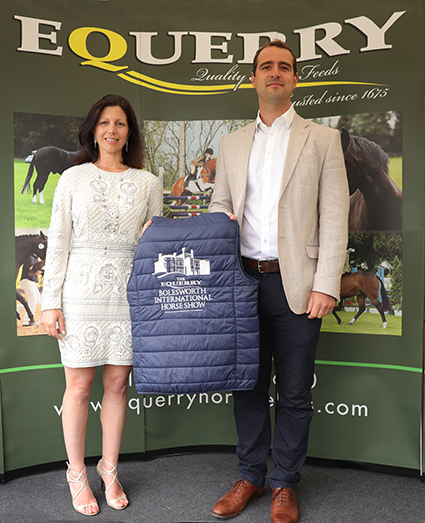 Said Show President and Founder, Nina Barbour: “We are absolutely thrilled that our brilliant partnership with Equerry Horse Feeds is to continue. Added Edward Lea of Equerry Horse Feeds: “This year’s show was the best ever with the organising team not only putting on a great event but also doing everything they could to promote the Equerry brand. 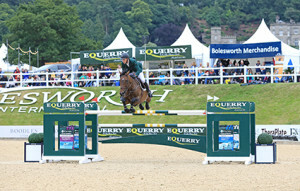 Added Equerry Grand Prix winner, Paul Kennedy: “The show is an absolute credit to Nina and the whole team. Paul Kennedy led an Irish grand prix one-two as this year’s Equerry Bolesworth International Horse Show reached a thrilling conclusion on Sunday. Paul, who is based in nearby Shropshire, captured the £30,000 Equerry Grand Prix top prize aboard 12-year-old Cartown Danger Mouse to deny his countryman Billy Twomey and Kimba Flamenco victory by just nine hundredths of a second. Decorated British Olympian – 62-year-old Yorkshireman John Whitaker – finished third with Cassinis Chaplin, while John’s nephew William Whitaker was fourth on Ilusionata van ‘T Meulenhof. Billy, twice winner of the Liverpool International Grand Prix, looked to have done enough as the five-day show reached a pulsating crescendo, but last-to-go Paul had other ideas as he guided his home-bred mare to victory in masterful fashion. There were hard luck stories as well, but the day belonged to last-to-go Paul, who thrived under intense pressure and claimed a truly outstanding success, punching the air as he crossed the finishing line in a time of 38.56 seconds. “I am absolutely delighted. It is a really good feeling,” Paul said. “It is certainly a day I will never forget. “To be honest, I didn’t feel the pressure so much. I was very calm. I have a really good team, and they had it all worked out what to do, and as I was coming into the arena I knew exactly what I had to. Billy, meanwhile, added: “Credit to Paul. His mare has been jumping well all the show, and he was probably the favourite today. “I thought the course-builder did a really good job. The course was difficult enough, and it made for a really good grand prix, very entertaining for the crowd. The grand prix brought the curtain down on another memorable Bolesworth, and Paul paid tribute to show president Nina Barbour and her entire team. “This is a very local show for me – I am just down the road in Whitchurch – and it is an absolute credit to Nina and the whole team.